Travel updates came to a bit of a standstill while I was travelling, due to cramming crazy amounts of fun into a relatively short space of time. 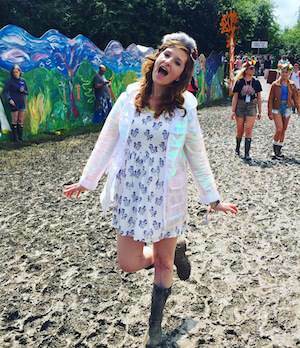 I decided it was stupid to worry about blogging while I was away and just leave it until I was back in the UK - which is now! I'm trying a new format of sharing travel posts and focus on imagery, personal experiences, highlights, new friends - more like a travel diary. If you do want to know specific information about travelling in New Zealand, like where we stayed, hostels I can recommend or how to get places then leave me a comment with an email address that I can respond to. I'll do my best to help if I can! Hopefully this type of post will appeal to a broader range of people, including my previous beauty/lifestyle/style readers too. We travelled around New Zealand on a big green Kiwi Experience bus - a great way to see the country, with an experienced tour guide helping along the way, you can take it slow and make your bus ticket last a whole year if you want. Unfortunately we only had 3 weeks to make our way around, but we saw so many amazing sights and met some awesome people thanks to the bus! First stop - the very beautiful Cathedral Cove, where we walked along the sunny cliff tops and down to the beach. The water is deceptively pretty - it's absolutely freezing! Josh attempted a swim but was in and out again in less than 5 minutes! 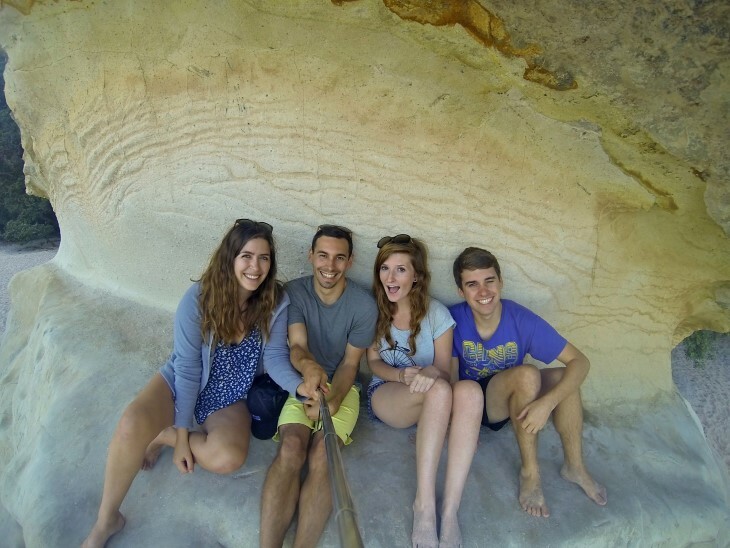 Here we met Alyssia and Jon, a Canadian couple who soon became our closest travelling buddies, and we took the first of many many Go-Pro selfies. In the evening we walked down to Hot water Beach at high tide, where you can dig your own hot tub [aka shallow pool of hot water]! The sea water is naturally heated on the beach by underground geothermals - some people had dug interconnecting pools for them and their friends, but we were happy to just dig a small pool and paddle our feet. Next stop on the bus was Waitomo - a town named after a series of underground caves with rivers running through them by the Maoris. We signed up for our first activity here, Black Water Rafting, which isn't too clear from the name but it's actually tubing using inflated car inner-tyres through rivers and down mini waterfalls in the caves. I was quite nervous at first, having never been in a cave that isn't a big, open tourist one - with these caves you had to squeeze through a couple of small gaps and crawl under some very low ceilings - but the guides were really experienced and it was completely safe! It was so much fun, we saw thousands of tiny glow worms covering the ceiling of the cave, we turned off our head torches and floated down a long underground river in total darkness, so we could see them properly. 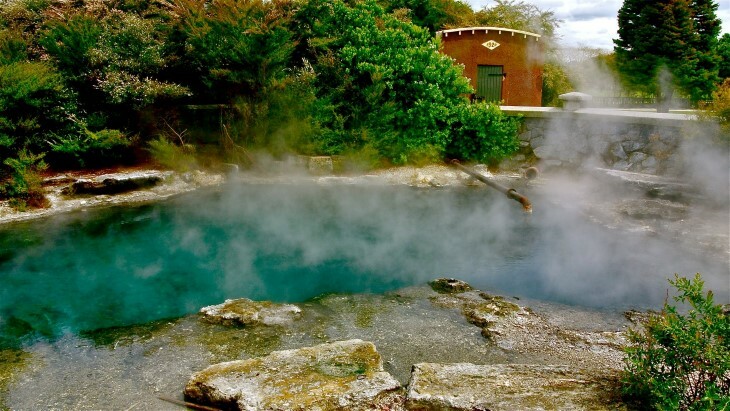 Rotorua is a town known for it's 'eggy' smell, thanks to loads of geothermal hot pools dotted around. They're a really cool natural feature, but unfortunately you can't get the bubbling hot water without the smell! Thankfully it's not constantly stinky, it kinda comes in waves, depending on which way the wind's blowing! Apart from the smell, Rotorua is also known for it's very strong Maori culture. 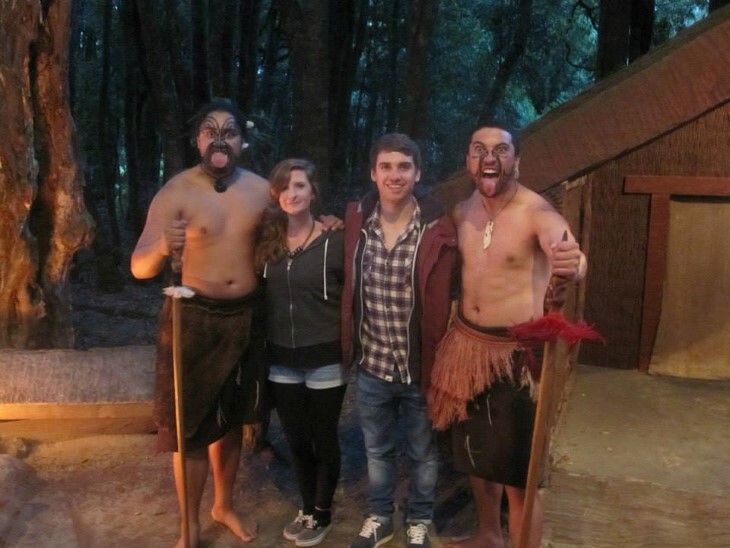 While staying in the town we visited the Tamaki Maori village - where they recreate traditional Maori life, demonstrate skills and performances of Maori songs, dances and war rituals. It was a really fun, interesting evening - followed by an amazing Maori buffet dinner of roast chicken, lamb, potatoes and salads. 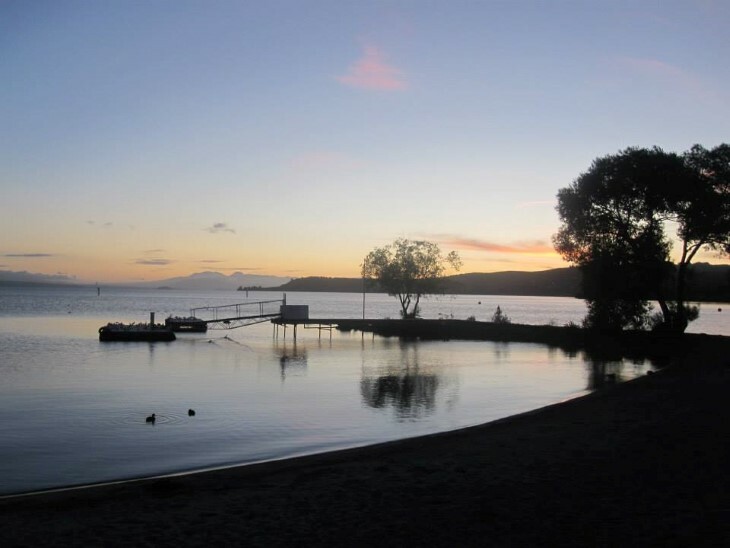 Taupo is the place for adrenaline activities like skydiving and bungy jumping in NZ! We didn't really feel like doing any of those, they just don't appeal to us, so we had a leisurely few days around the small town taking in the massive amounts of street art, shopping and cruising around the lake on a sailing boat. 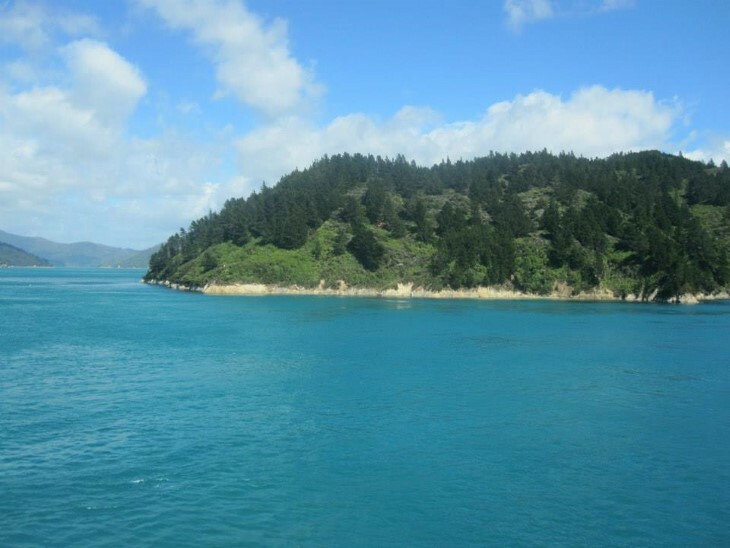 Beautiful water and landscape crossing the Cook Straits between the North and South Islands. It was such a windy journey across to Wellington! Could New Zealand be any more beautiful? Gosh I would love to go there one day! Gosh, those hot pools STINK haha! 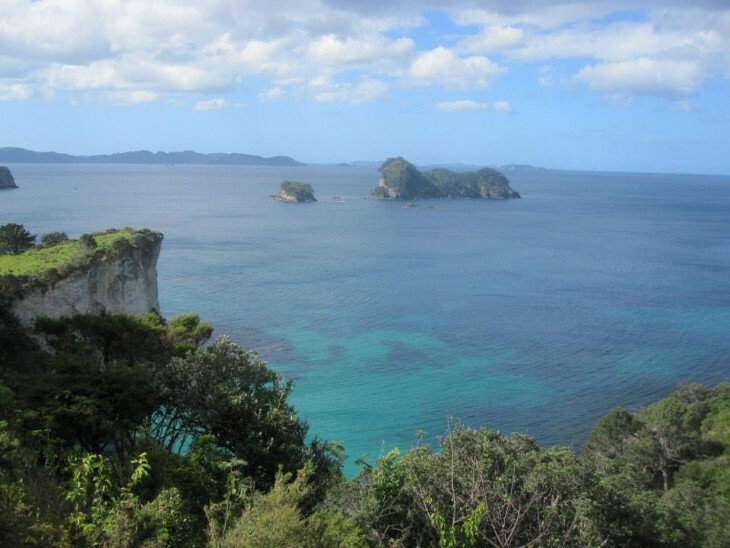 I loved Cathedral Cove and the whole darn country. Part of me wants to go back for my honeymoon but there are so many places in the world I need to visit! SOB.